First, I believe we need to address a very important issue. Deep breath because there will be a lot of emotions here. Do you pronounce if GIF or JIF? Allow me to settle the battle for once and for all. It doesn’t stinking matter. Now that we have that out of the way let’s talk about this novel little addition is changing the face of business. As always, the first thing I get excited about is the psychology behind the form of communication. An easy piece to understand is the mere-exposure effect. This phenomenon explains that we have a preference for things that we are already familiar with. In our society, media is the most common denominator. I know, there are always going to be outliers. There is generally at least one in every crowd that wants to loudly tell you how they have never watched TV or that they keep themselves pure of the mind pollution of popular media (Uh….ok…cool. I’m gonna talk to this other 99.999 % of people). Most people have some common experience and when you can use that commonality to express a thought or emotion it has more resonance for the recipient. Most of the time GIFs are used to communicate emotion. EMOTION, the cornerstone of communication! Take into account Albert Mehrabian’s 7-38-55 Rule of Personal Communication. 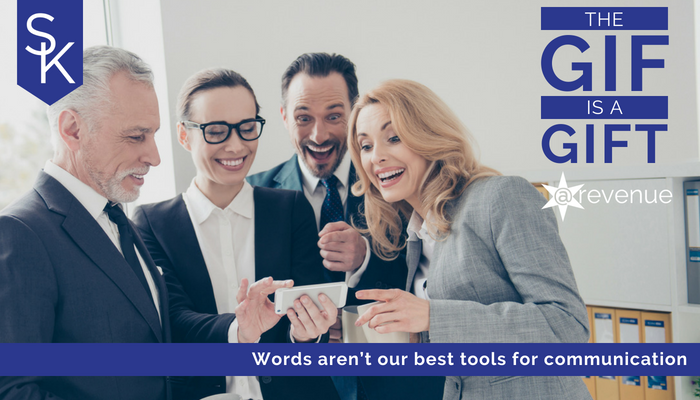 If you are relying only on words to communicate your message you are leaving 93% of your ability to communicate on the table. We also know that people make decisions (about everything) based on emotion and back it up with logic, so if you are effectively communicating to and connecting with emotion, are you doing your level best to get the recipient engaged with your message? “First, my lack of knowledge about pop-culture and trivia made me hesitant to follow, but after just my first few experiences, using GIFs takes a weight off my shoulders as a writer. I can lean more on my GIF selection to set the tone. I don’t have to be funny – I can just find something funny instead. Just last week we entered a NEW client intake meeting (not yet full clients) and they mentioned that they were so happy when I used a GIF in the email because they automatically knew that we were cool (read that as ‘we are like you’), we have a sense of joy and humor, and that we were going to be fun to work with. A tip of my hat the Mr. Sinatra dancing in the rain! If your internal staff and your new clients appreciate it, how can you create a GIF-embracing culture of your own? Well, start with a few rules and tools. Use an email plug-in tool like https://giphy.com/ that will allow your team to add images on the fly. They simply need type in a search term like excited, happy, or raining and a small list of images will pop up for them to click on and add to the email, slack channel or the like. Encourage common sense! This is not a place for profanity or lewdness just like ANY OTHER part of your work. Know thy audience! If it is your initial conversation with someone and you don’t know if they have a sense of humor to speak of it’s probably not what you want to lead with. You need to have a few exchanges with someone before you will know if this is something that is a fit for them. To meet the demand, many of the tools you already use are adding GIF searches to their services. Facebook, Twitter, Mailchimp just to name a few have adopted the movement. Want to create one of your own? Forbes even gives you a step-by-step so that you can show off a product or even a great part of a speech. At the end of the day you have to decide if it is brand congruous for your internal team and your external communication, but for me and my house….we will GIF IT UP!